From flooring and cabinetry to moulding and furniture, American hardwoods have been treasured for generations, and for good reason! They offer warmth, durability, luxury, and design options that are unmatched by faux-wood products such as laminates and bamboo. Recently, however, an abundance of green product labels and misinformation has led to confusion in the marketplace, and has everyone asking, "Are American hardwoods really a sustainable resource?" And "Are the hardwood products I want for my home really green?" The answer to these questions is a resounding yes! And now, homeowners have assurance from the federal government that American hardwood products are not only beautiful, but truly green and sustainable. The U.S. Congress passed resolutions in 2009 and 2010 which officially recognized that the American hardwood industry sustainably manages an environmentally preferable, natural resource, and that hardwoods should not be discriminated against in government procurement programs. In March 2011, the U.S. Department of Agriculture (USDA) agreed and announced its endorsement strategy regarding the merits of domestic wood as a preferred green building material. Agriculture Secretary Tom Vilsack, in keeping with the USDA endorsement of American hardwoods as a sustainable material, directed the heads of all USDA agencies to begin increasing use of locally milled lumber in all new agency buildings and facilities. Also, the U.S. Forest Service will examine ways to enhance research and development being done around green building materials. American forests continue to be a trusted source for sustainable and legally harvested timber. Imported wood and wood substitute products are not regulated like domestic products, and their quality control standards are inconsistent. In addition, local availability and manufacturing significantly minimizes the environmental impact of transporting hardwood products. Hardwood forests naturally regenerate themselves and do not need to be replanted like softwood forests. For this reason, their harvesting methods differ. The preferred method of harvesting hardwoods is single-tree selection. A professional forester evaluates a forest and determines which trees are ready to harvest. This responsible forest management practice not only provides a sustaining supply of hardwood, but it also ensures the overall health of a thriving forest - including water quality, wildlife habitat, biodiversity, and recreational opportunities - and has allowed the volume of our hardwood forests to more than double since the 1950's. Thanks to the work of our foresters, wood is a carbon neutral material. Healthy forests are net producers of oxygen through photosynthesis. Growing trees absorb carbon dioxide from the atmosphere, and separate the carbon and oxygen atoms. The oxygen is released back into the atmosphere, while the carbon is used to grow roots, trunk, branches and leaves. The carbon is then stored in the wood for the life of the tree and the products made from it. In addition, natural wood products are among the most energy-efficient to produce, while making products from steel, aluminum, glass, concrete, and brick can require up to 126 times more energy to manufacture. With hardwood, the manufacturing process is limited to running a saw blade and kiln drying. In comparison, the steel and concrete manufacturing processes consist of numerous procedures that are extremely energy intensive. And for both, unfavorable environmental consequences result from open pit mining and from the substantial fossil fuels expended and emissions generated in the processing of the raw materials. Furthermore, advanced technology and manufacturing assures the least wood waste and efficient use of wood by-products. For example, tree bark becomes mulch and soil conditioners, sawdust is used for animal bedding or as fuel for boilers to operate dry kilns, and trimmings can be used for wood components and paper. No other material can compare. In our homes, hardwood products are some of the healthiest and cost-effective ones we could choose. They do not collect dust or allergens - which can be trapped in other materials - and environmentally friendly paints and stains can be used to complement any design scheme. 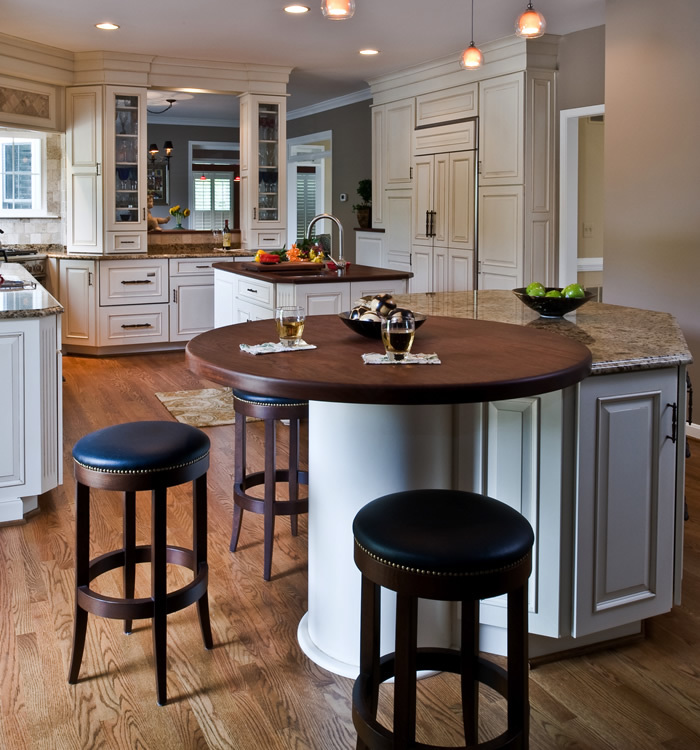 In addition, hardwood products can be refinished and can last a lifetime. A solid hardwood floor, for instance, can last in excess of 100 years, while carpet would need to be replaced numerous times during that span. At the end of their useful lives, hardwood products can be repurposed, used as a combustible fuel, or returned to the Earth, whereas synthetic and heavily-glued products like bamboo, will remain in a landfill almost indefinitely. It's clear. There really is no better or natural choice for green building and healthy home environments than American hardwoods. And now, with the endorsement of the federal government, eco-conscious homeowners can confidently choose American hardwood flooring, cabinetry, and millwork for their homes.